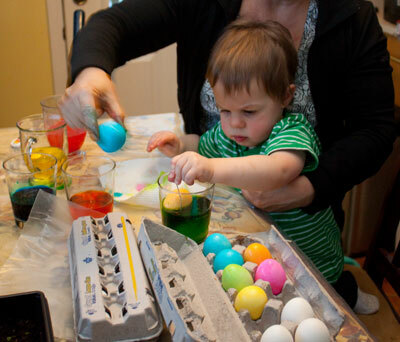 Starting the egg dying process – He’s so intense! 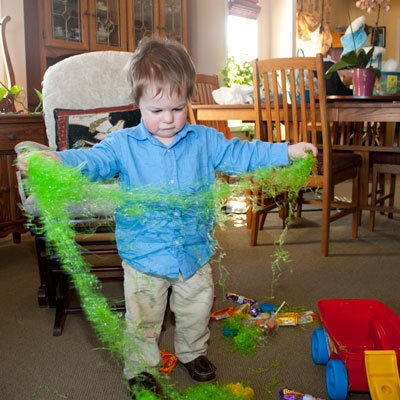 Out of all the things in Norton’s Easter wagon (instead of a little basket, I got a little Mega Blocks wagon and put Easter stuff in it), the thing he enjoyed the most was the Easter grass in the bottom. I’ve been silent for a couple of weeks, and that’s largely because I’ve been busy with my new baby girl! Today I took Norton and Eudora for pictures with the Easter bunny. I knew that Norton was not impressed with Santa, so I figured I’d go the safe way and put Eudora on the bunny’s lap, first. Then if all went well, I’d get a picture of Norton and Eudora, then just Norton. That was, of course, if all went well. I did get an adorable picture of Eudora, but Norton was terrified of the Easter bunny. As soon as the husband brought Norton over, he cried and tried to run from the bunny. So we tried getting the husband to hold Norton near the Easter bunny. No joy there, either. As soon as Norton’s little feet hit the floor, he ran away as fast as he could. At least we got a picture of Eudora!